Planning a trip and trying to work out an itinerary can be a lot of fun, but intimidating at times. Which places shall I put on on my list? What can I skip? How long do I need to stay in one place? 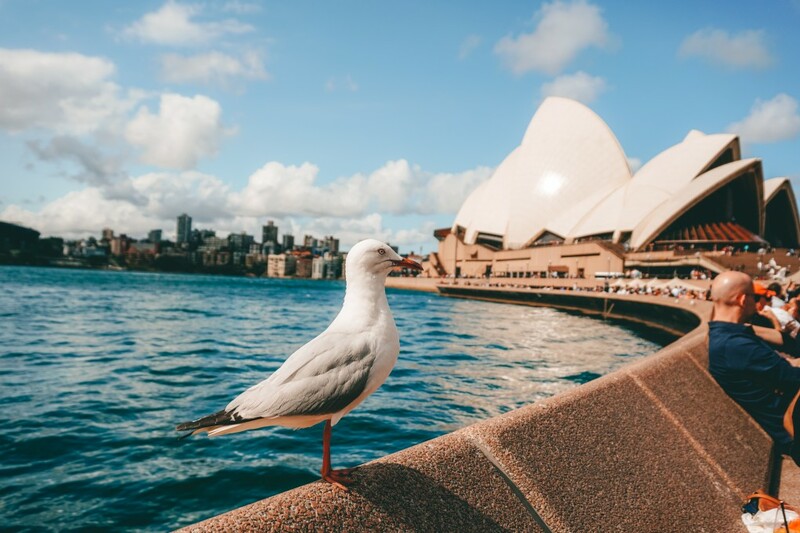 This itinerary is intended to give you an overview on which places are worth seeing and a recommendation on how much time to plan at each stop. I have travelled from North Thailand to Laos and made my way to the Cambodian border. Depending from where you are travelling you could do the same itinerary, do it the other way round or mix it up a little bit. Leave some room for spontaneous trips on the side and if you like a place don’t hesitate to stay longer to enjoy it to the fullest. 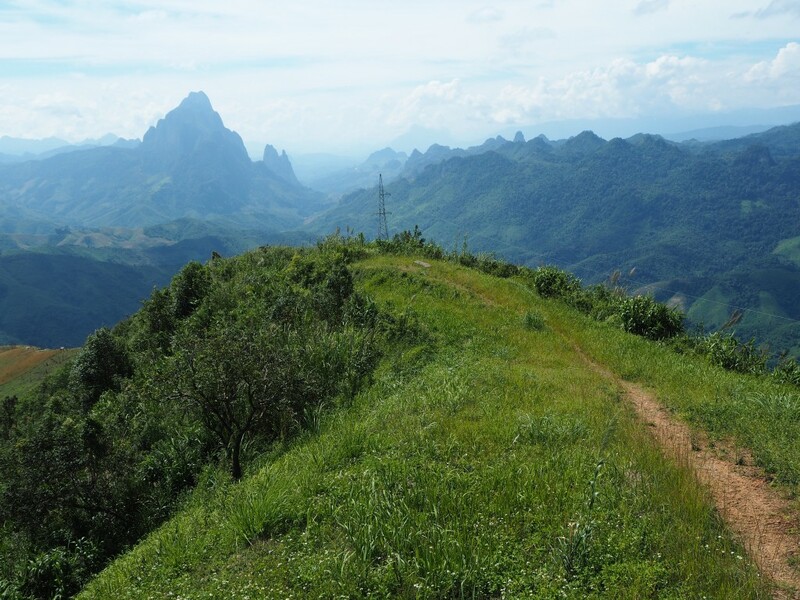 So here it comes, a suggested itinerary for your travels around Laos. On the boat they sell drinks and lunch, but of course you can also bring your own food. Sit down, relax and watch the scenery pass by. In between the days you will stay in a small town for a night, where you can look for a guest house or do a homestay. 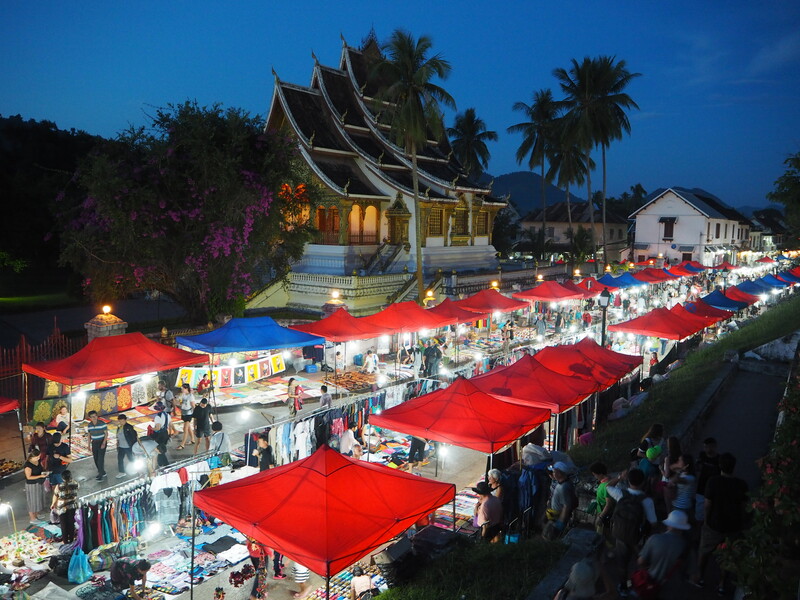 Luang Prabang is one of the nicest places to visit in Laos. 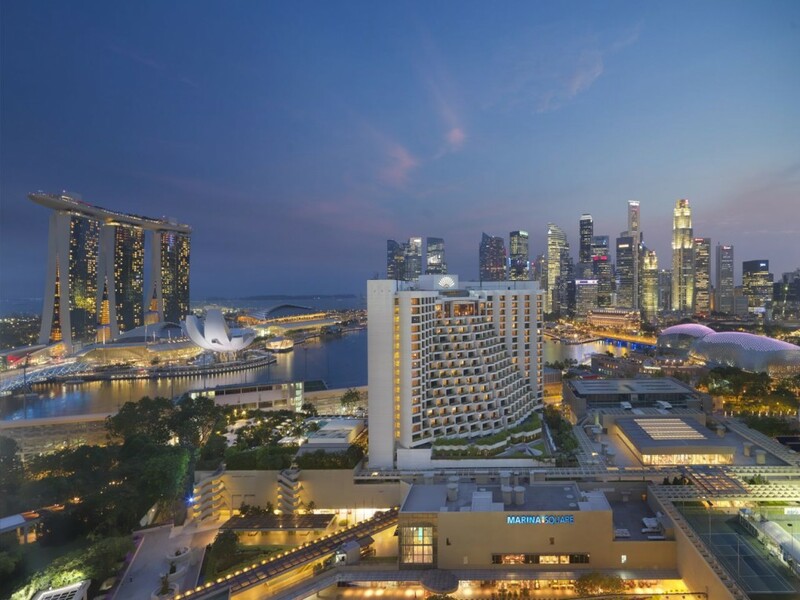 Bring plenty of time to enjoy the city and to take in the relaxed vibe. 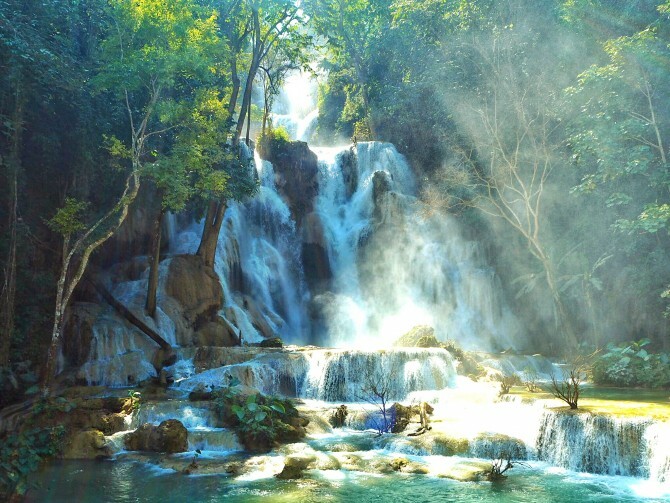 Reserve one day for a visit to the spectacular Kuang Si Waterfalls, the other days spend at your liking. Do a cooking class, wander around or spend the entire day in a bean bag at utopia with a cold beer in your hand – it’s completely up to you. 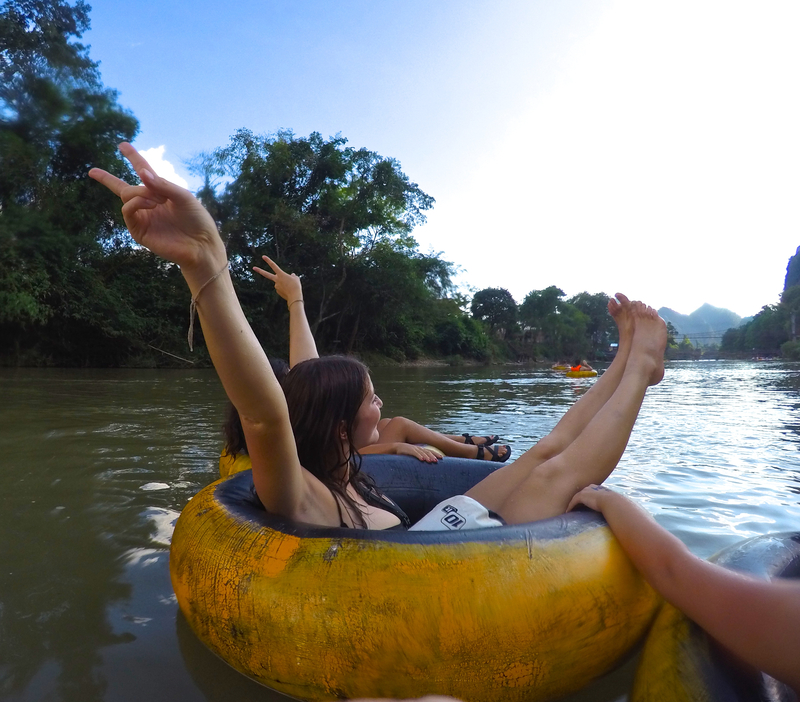 For a full guide on what to do in Luang Prabang, check here. After a few relaxing days in Luang Prabang it is time to take the bus to Vang Vieng. A 5 hour journey leads up and down mountain passes. You will be glued to your window as the scenery is simply breathtaking. 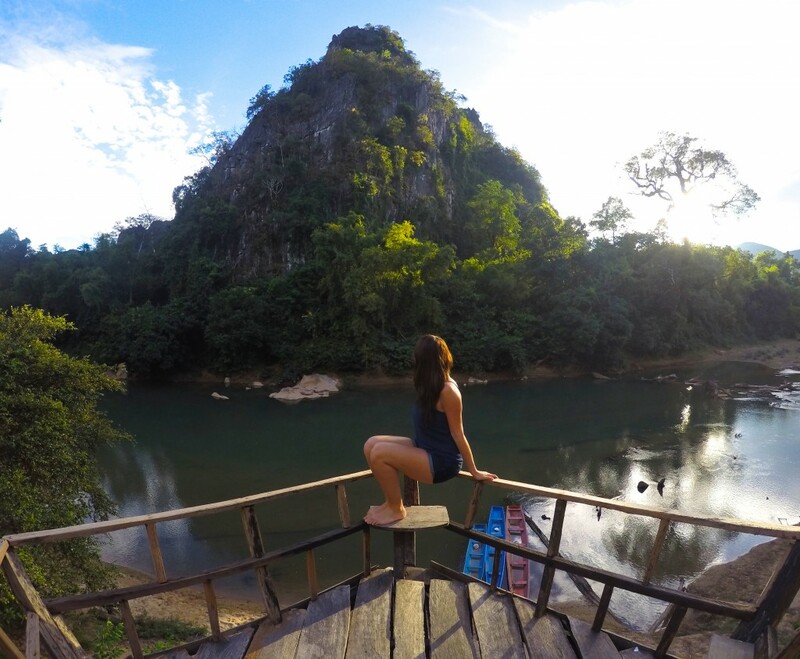 Vang Vieng itself is a great place to do outdoor activities such as kayaking, trekking, caving or climbing. The nature is beautiful here, so bring some time to enjoy it and to explore the area. A very popular activity is tubing down the river. A few years back it was crazy with bar after bar lining up at the river. Accidents happened, so a lot of the bars are shut down. There are still a handful open and you can stop for a drink on the way down the river. 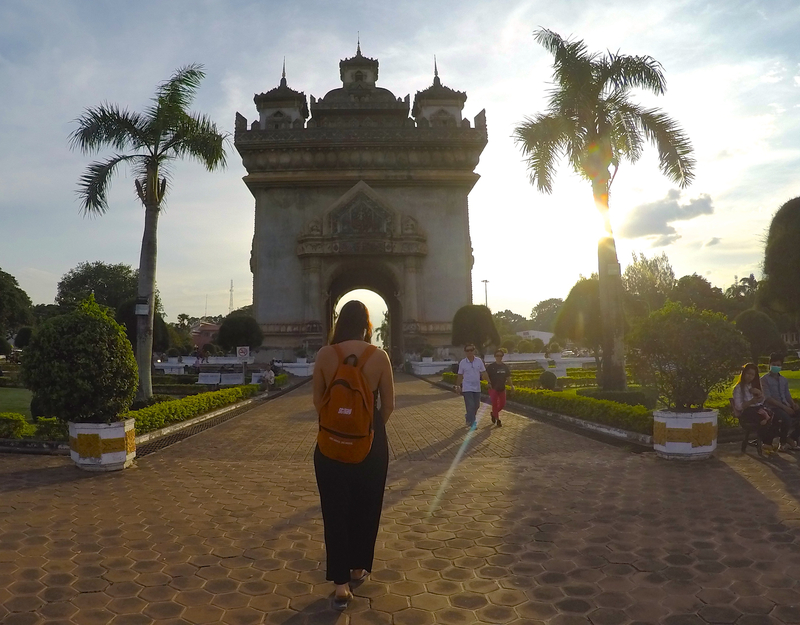 Vientiane is the capital of Laos. There is not that much to do here, so just plan a little bit of sightseeing in. Visit Paxutai- the „Arc de Triomphe“ of the city, have a look at the temples and make a stop at the COPE Visitor Centre and learn about the sad story behind the „secret war“. If you want to have Western food or go shopping, do it here. Vientiane has a lot of good, international restaurants and plenty of shops were you can get what you need. Kong Lor is not on everyone’s itinerary yet, so make sure to go there and explore this natural wonder without the crowds. Kong Lor Cave is 7.5 km long and can be visited by boat. A tour takes you through this fascinating cave. It is pitch black inside and you will only be equipped with torches. Some areas are lid up and you can get off the boat and go out to explore some more. The area around Khong Lor is very relaxed and it is great to just take some time off. There are some really nice guest houses by the river, where you can spend the day swimming and indulging in good food. My recommendation for a guest house would be SpringRiver Resort- f0r 10 $ a night you will have your own cozy bungalow. The city of Pakse has not much going for it, but there are some really nice attractions nearby that you shouldn’t miss. 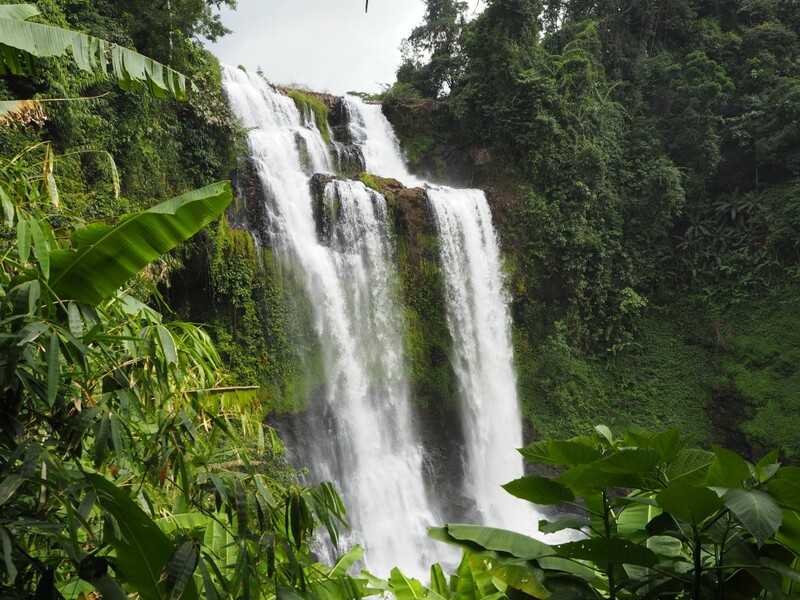 One is the Bolaven plateau with its coffee plantages and the spectacular twin waterfalls where you can take a refreshing dip. If you are comfortable on a motorbike, there is a motorbike loop of the Bolaven plateau that takes you past all the highlights. The other must do is Wat Phou, a fascinating historical site of Lao ancient history that dates back to the 5th century. The Khmer Hindu temple complex was built by the same people that also built Angkor Wat and has a lot of similarities. Now it is time to relax. 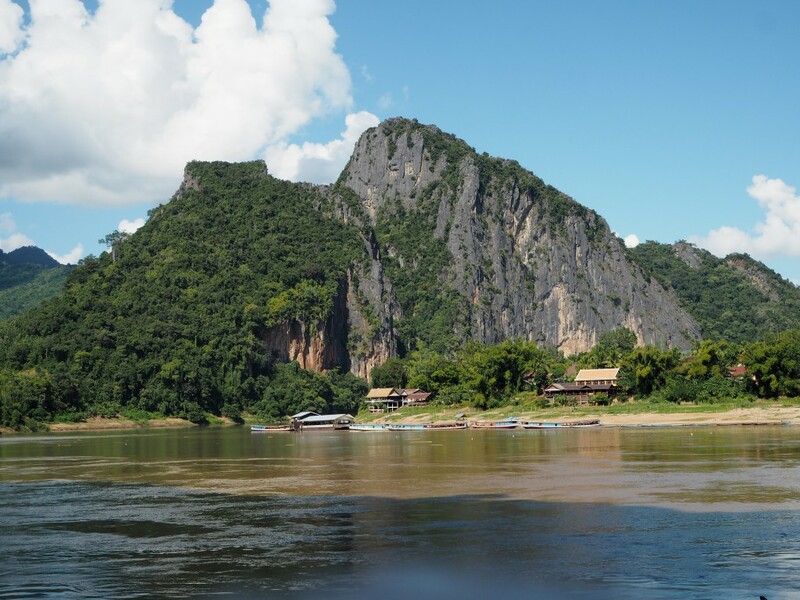 Laos has no ocean and no beaches, but who needs that if you can visit the 4000 islands. 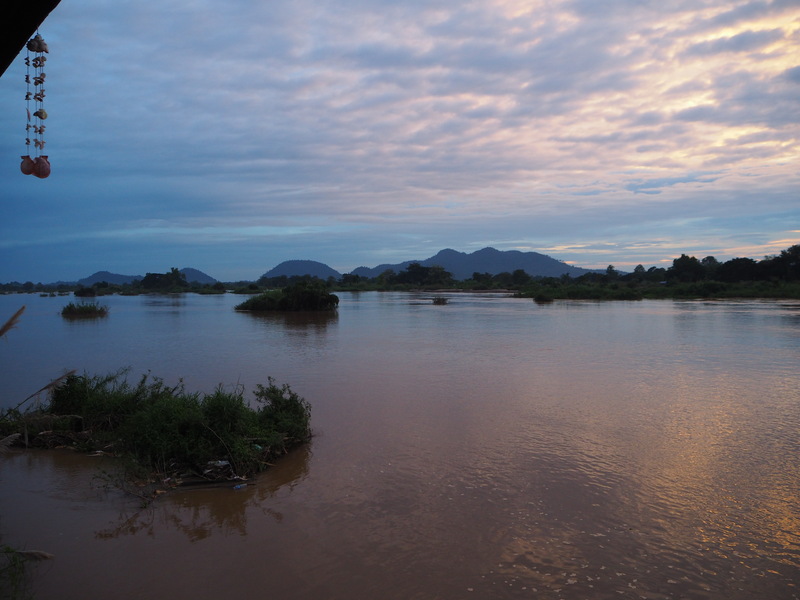 There are situated in the Mekong just before the Cambodian Border. Don Det is getting more and more popular as it offers a relaxed armosphere, has some cheap guest houses and a few nice bars. The island itself is very small. 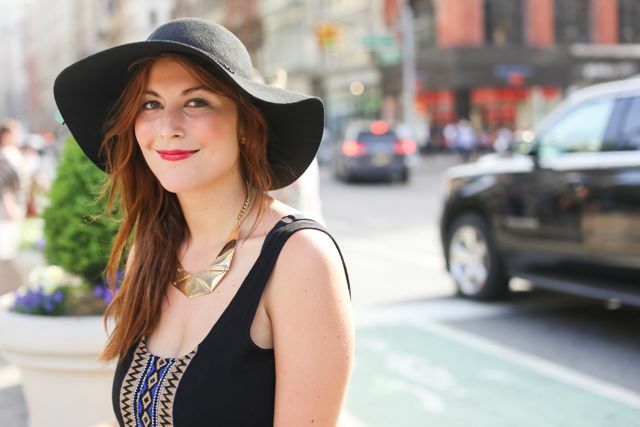 If you want to walk around it, it would probably take you less than two hours. 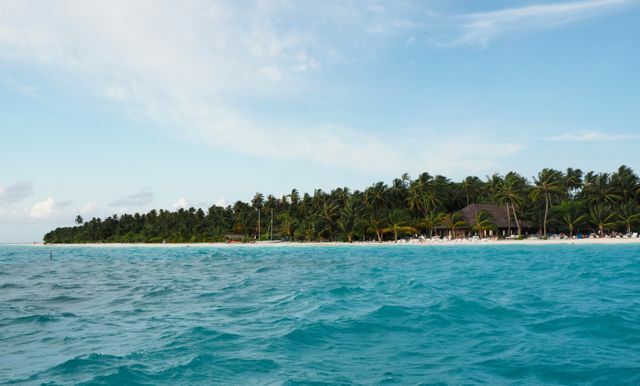 However the relaxed vibe makes it so special and it is nice to spend some time here just to relax and do nothing. I have heard of people spending over two weeks here because they liked it so much, however 3-4 days should be enough before you move onwards. Hope you have a fantastic time in Laos. I had about two and a half weeks in this country as part of the Stray Asia Full Moon Pass and loved every minute of it. Traveler’s Little Treasures was invited by Stray Asia to join on their Full Moon Pass however my opinion is, as always, my own.